Driver's distraction is one of the main considerations in vehicle safety and has increased tremendously in the last decade, as can be seen in the proposed guidelines, published by the NHTSA. Yet, the vision of Un-Distracted Driving (UDD) – seems to remain unreachable. The technological development in the automotive industry is constantly growing, attracting talents and resources from a variety of industries. Automakers are striving after technological advancements, acquiring startups in order to enrich their technological portfolio and increase their market share and P/E ratio. Global tech. players such as Google, Apple and Microsoft are investing resources and leading some of the major trends in this arena. Despite the increase of electronic systems in the car, targeted at assisting the driver, a driver’s cognitive capabilities required to operate these systems have not improved greatly over the last decade. Therefore, the question of Do these systems reduce driver’s distraction? Are we now safer in our cars? - remains unclear. One of the major trends in the high-tech industry, comprising of 6 levels, as defined by the SAE, from Level 0 (a human driver does everything) to Level 5 (The vehicle can perform all driving functions with no human input needed). Nowadays we can see some (high tier) commercial cars having Level 1 & 2, with the leading players in the autonomous arena (such as Google, Tesla, Mobileye & BMW) mentioning full autonomous starting at towards 2025, however government and regulators might delay it for non-testing purposes for another few years. A recent sales forecast by Wards Intelligence expects 10 million Autonomous vehicle sales globally in 2030 and nearly 60 million sold globally through 2030, comprising about 3.5% of total vehicles. Hence, full implementation is not forecasted for the next few decades. In the near future, we are expected to see a combination of level 0 cars and low-mid levels of autonomous cars (2 / 3). Danger Factors: This situation poses some danger factors concerning the need to learn how to read human behavior for complicated driving situations, such as older roads without lines on the road, lack of lights, and busy intersections. Moreover, ice, snow, and other weather conditions can obstruct a sensor from doing its job correctly. Recent accidents with autonomous car (self-driving-car-crashes) are yet additional reminders to this danger. Another danger factor concerns the coexistence between level 1/2 cars and ‘regular’ cars (level 0), posing a danger caused by both the autonomous car and human error. Connected car systems, led by Apple Car Play and Google Android Auto are a growing trend, linking major software companies with the automotive industry, enabling the driver to use some of the cellphone’s applications directly on the car’s central display, thus aiming to create less distraction than by using the driver’s cellphone. Business Insider Intelligence estimates that 75% of the estimated 92 million cars shipped globally at 2020 will be built with internet-connection hardware. However, of the 220 million total connected cars on the road globally in 2020, it is estimated that consumers will activate connected services in only 88 million of these vehicles – 45 % of the total potential. Danger Factors: involve the distraction caused by using these systems, requiring active manual intervention (e.g. hand off the wheel for operating these systems) or even just verbal activation. 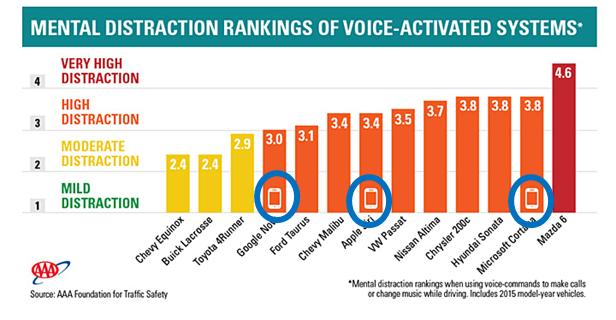 A recent study conducted by the AAA shows voice activated systems might pose HIGH DISTRACTION. Systems that are aimed at assisting the driver, detecting dangerous situations and acting autonomously to avoid accidents. Major ADAS technologies are attracting less than 10% penetration, expected to grow to nearly 25% in 2020, with the leading systems are: Park Assist System (PAS), Lane Departure Warning System (LDWS) and Blind Spot Object Detection System (BSD). Stress created due to requiring performance of new tasks (e.g. programming the navigation system or learning how to use the Adaptive Cruise Control) and the lack of user-knowledge for operating these systems. While the cognitive expenses necessary to learn how to operate the new systems are usually significant, the lack of training increases the risks of faulty operation, which might lead to ineffectiveness or even to traffic accidents. Excessive reliance on ADAS could deteriorate the driving performance, as driver's attention is shifted away from the driving task into monitoring task. Failure of ADAS (e.g. communication or software error). Activities that are done by institutional parties such as the NHTSA and the FCC in relation to driver’s distraction are mainly gathering statistics and issuing guidelines (see footnote 1). While we can see some increase in enforcement activities – mainly by the police - the increase of driver’s distraction due to cellphone use and the above-mentioned systems, is more substantial than the enforcement activities. Driver’s distraction is the top cause for accidents in the US, followed by speeding and drunk driving– causing nearly 40% of accidents, by many studies (Top 3 Causes of Car Accidents in America). Texting & Driving (T&D) combines the 3 types of distraction – visual, manual and cognitive, and is the leading cause for distraction (www.cdc.gov). The inevitable conclusion is to implement a more active approach in order to reduce driver’s distraction in the next 1-2 decades (at least), until fully autonomous vehicles are vastly implemented. The solution would have to be embedded within the vehicle, enforcing a DriveMode at the driver’s cellphone (i.e. not being able to use dangerous applications while enabling use of speech, navigation or music), while not affecting other passengers. This solution must not rely on driver’s cooperation. SaverOne™ (www.saver.one), an Israeli startup, has developed a solution that implements a comprehensive approach to assure DriveMode throughout the drive, without the need for driver cooperation. This unique solution assures that any driver in a vehicle equipped with SaverOne, will experience Un-Distracted-Driving (UDD). Such a solution will dramatically decrease driver’s distraction, enabling him/her to focus on the driving activity. A Connected Car with such a solution would have higher adoption rates of using the connected services since driver would no longer be able to use his/her cellphone (other than for the allowed applications). Market analysis shows that although there are few solutions targeting at decreasing the T&D, adoption of such solutions by the drivers is low. SaverOne's solution, not being dependent upon drivers' adoption, is likely to be vastly implemented, reducing accidents' rate. In the near future, the new car will be equipped with an active Un-Distracted-Driving (UDD) enforcement system. Such a car will actively decrease driver distraction, assuring DriveMode throughout the drive, enabling the use of only permitted applications in the driver’s cellphone. Adoption of the connected services and the ADAS will be increased, while not sacrificing driver’s attention. Global implementation of Un-Distracted-Driving (UDD) enforcementsystem will result in reduction of about 25% of accidents and thousands of lives being saved globally. The economic implications of the accidents’ reduction are expected to be savings of billions of dollars, annually.